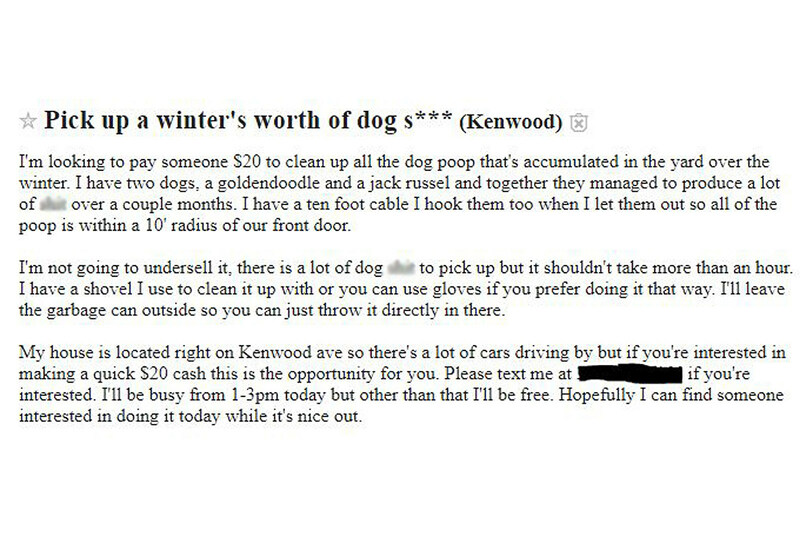 Is This The Best Duluth Craigslist Gig Posting Ever? If you need to make a quick $20, we've found a gig on the Duluth Craigslist that can help you with that. This post was sent to me today and I can't stop thinking about it. Before you check it out, I'm throwing a soft NSFW tag on it as there's some minor swearing in it. Nothing crazy, but it might be hard to justify to your boss at work why you're looking at it, so just looking out for you here really. If you don't laugh at the "I'm not going to undersell it, there is a lot of dog s*** to pick up" line, I don't think we can be friends. Then the line of living right by a major road so heads up there will be a ton of traffic while you clean up my yard is pure gold. Also, the poster talks about hopefully getting it done soon due to the warm weather. Wouldn't you want it a little colder? I imagine that situation is kind of like how you want your ice cream. Also I get that it's only an hour, but if it was me? No way $20 is going to cut it. Bump that price up or no deal.